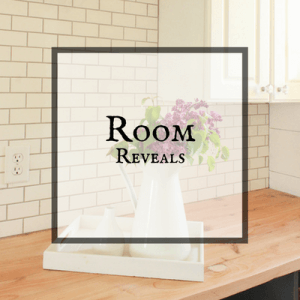 Do you want to transform a thrift store headboard to farmhouse style wall decor? You can do anything with anything. What? Its true though, even if it doesn’t make sense. You really can though. Why does something have to serve just one single purpose when it can be so many different things! Today, yes, today, I stopped by our local thrift store just to see if they had anything good. My daughter came with, and she was thrilled by all the old barbies, and mismatched plates! 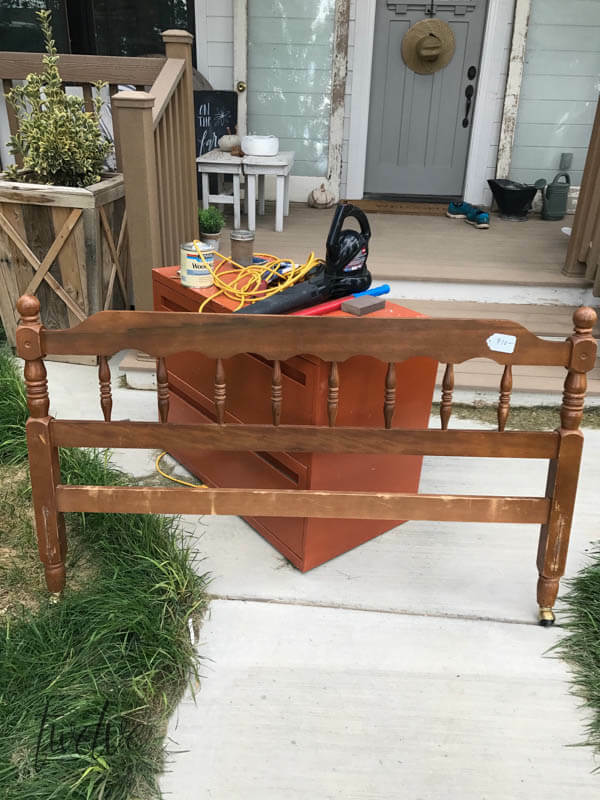 She was just as thrilled as I was when I came across this leftover headboard sitting all by its lonesome. For 10 dollars. Yep. For 10 dollars, I could take it home, experiment, and if it didn’t turn out right, I wouldn’t feel too bad about it. But I knew I could turn it into something cool. I decided to use it as this months thrift store challenge project! 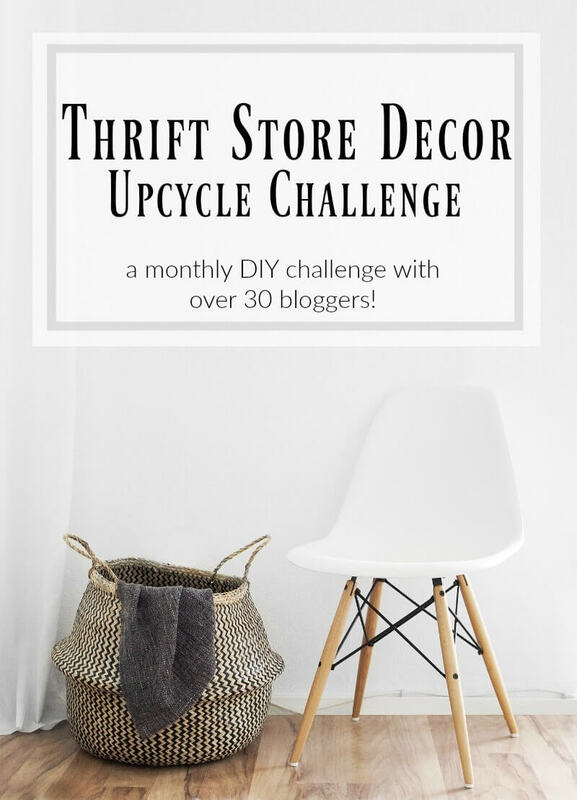 Are you new to our thrift store challenge? Check out below! 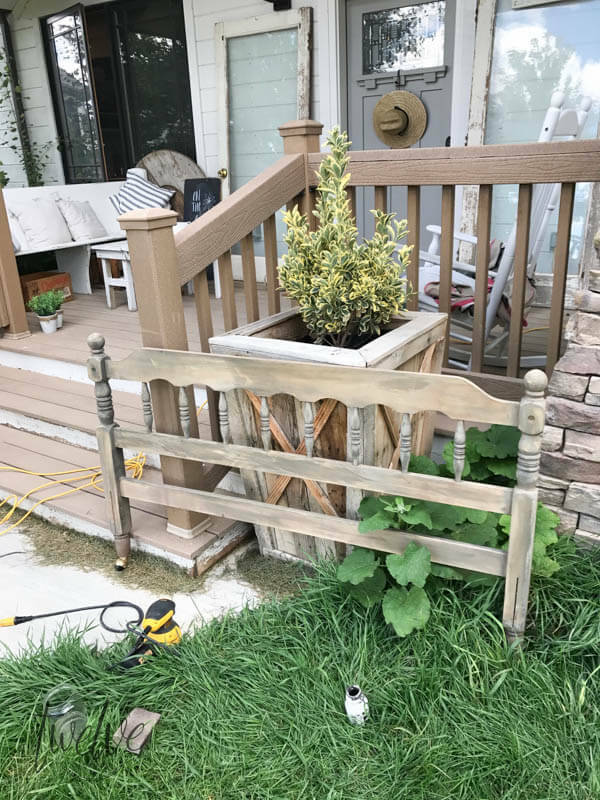 My first thought was to build a bench, but honestly, I didn’t have any room for another bench in my home and I really didn’t want this to become a while thing. You know the kind. The kind that end up taking up your whole day, when you didn’t have time for it in the first place? Yep, that kind of thing. But, I am always game for something cool on my walls. 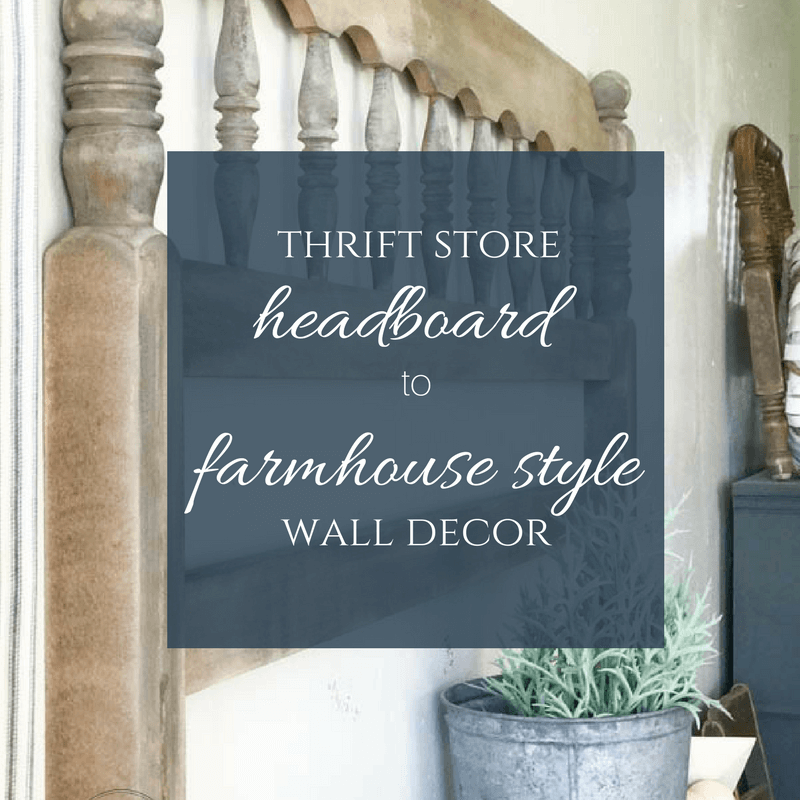 So, I decided to transform a thrift store headboard to farmhouse style wall decor. This is the deal. 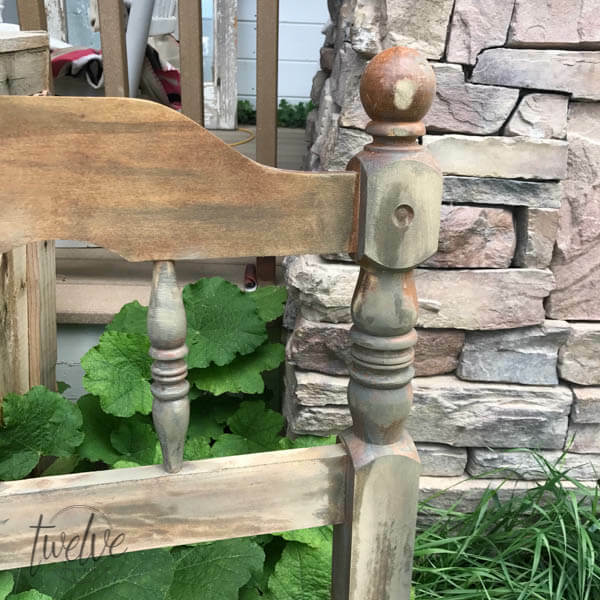 This headboard had a plain, not so pretty finish on it, that was definitely not very farmhouses style. It had that reddish orange shade of stain on it, and it just was not going to look good the way it was. So, I did what any normal woman would do. I began beating it up with my orbital sander, thinking this was the answer. Well, it was….kind of. All the flat spots were super easy and quick, but lets talk about the spindles. They were not happening. There was no way I would have enough patience to sit and sand each one down with a piece of sandpaper. I mean, I do have some sense of self. 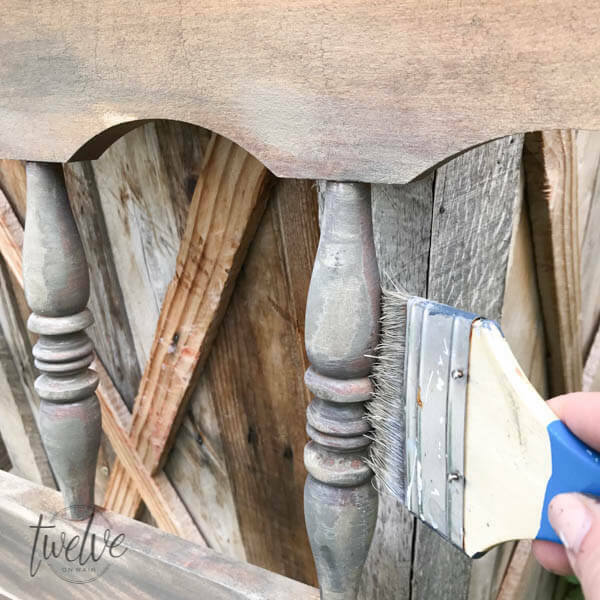 It was time to pull out the paints and see if I could create a faux aged wood finish without the 100 years that are generally needed. 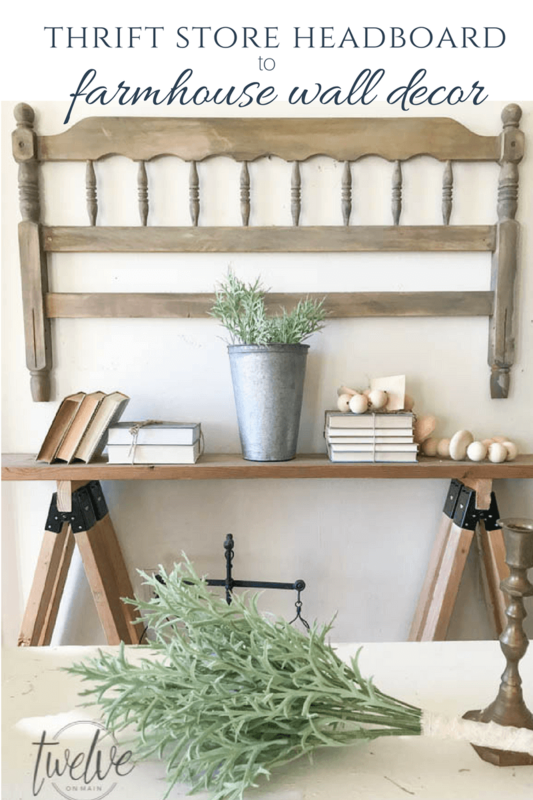 Thrift store headboard to farmhouse style wall decor gets an aged wood finish…here’s how! 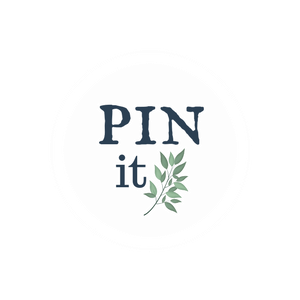 Have you ever used Plaid paints? 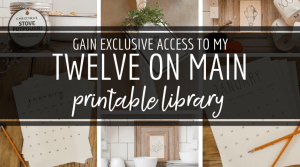 I have a whole bunch and I love their milk paint for lots of different reasons. I find that it is thin enough that I can apply layers of this paint, creating interesting design and a lot of cool depth to the piece of furniture I am working on. 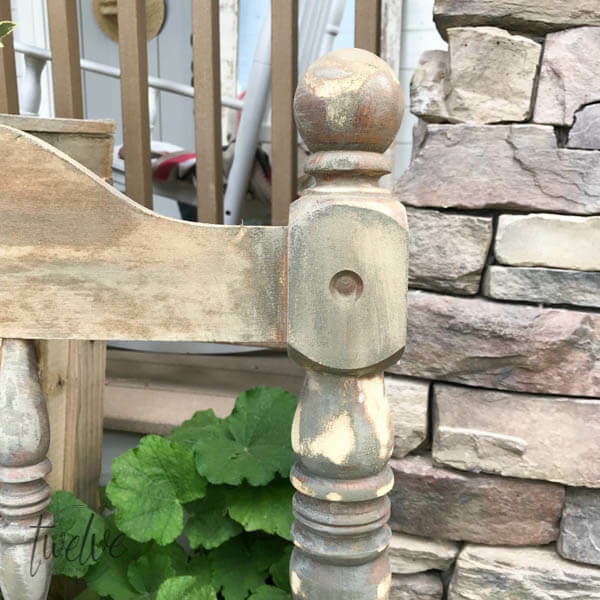 These colors we chosen because I thought that the lighter color would be a great way to wash out the wood and give it a more weathered look. I chose the dark to add depth is some spots. So, what I did was sand down the flat spots of the headboard. I then took the orbital sander and sanded as many edges of the rounded parts as I could. Just enough to break up the varnish. I then started dry brushing some of the Plaid Folk Art Plymouth Rock Milk Paint. I decided to add a little bit of water to thin out the paint and just lightly brushed it over some areas because it was dark. Panicking did happen, because it was not looking good. Then I started to add the Plaid Folk Art Milk Paint in Britches, and it completely transformed the piece! The key to creating this weathered effect was to not paint an even coat. It should be lighter in some places, and thicker in some places, and none in some. There is no real plan when doing this. Just add a little, and brush a little off. Stand back and see how it looks. Add a little more, applying it in a stippling effect(tapping the brush into the surface instead of sliding it across). Let it dry, and then add a bit more. Just focus on making sure you don’t just paint it on, that will be okay if what you want is a solid color. What I wanted was a bit of a random look to it. 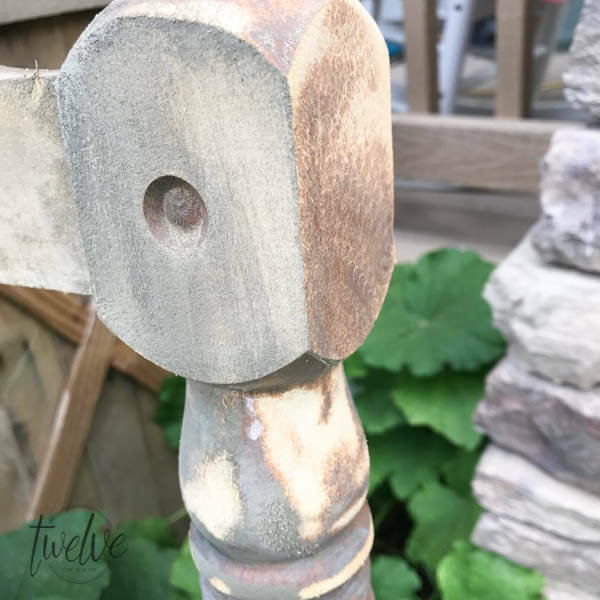 The color was perfect to add that washed out appearance of weathered wood. The last thing I did before hanging this baby on the wall was rough it up a bit. 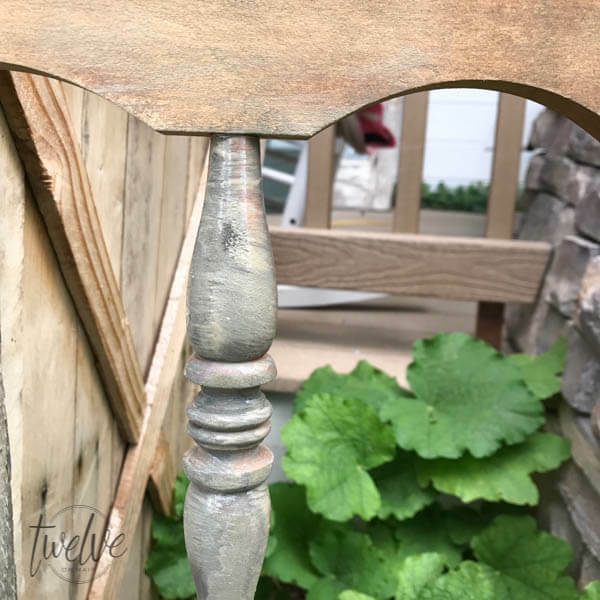 This headboard needed a little bit of a distressed look to appear like it had been weathered over the years. I took my orbital sander, and while the paint was still slightly damp, I ran it across a few spots. It roughed up the grain, and changed look of the headboard. I did not do the whole thing. I only touched the headboard in a few spots, just to add some variation. Finally, I had to seal it. Milk paint needs to be sealed, and I used Plaid Folk Art finishing oil to seal it up. It worked perfect. I hung it on my wall in my family room. I love it in this space. The way the light plays off the spindles is so awesome. I find it interesting when people take functional objects and use them for a completely different purpose. 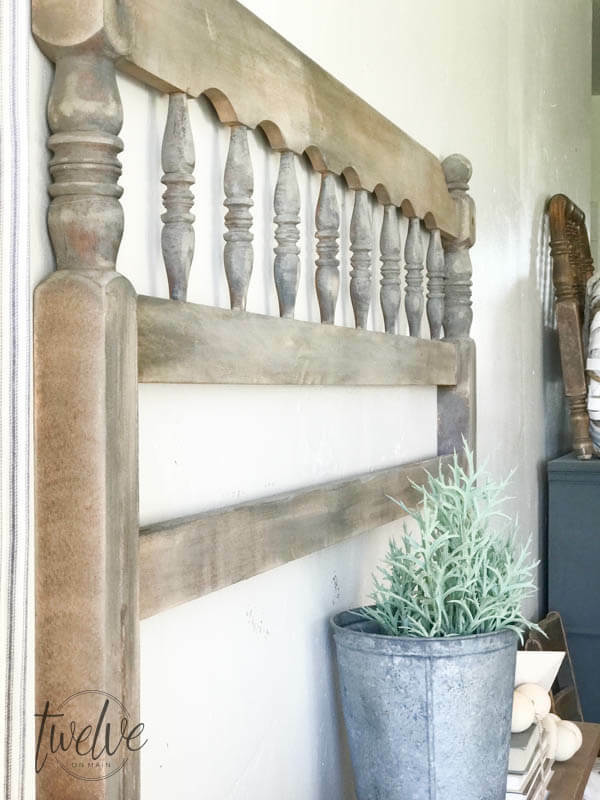 This headboard was meant to be on a wall, and I am sooo in love with the transformation of my thrift store headboard to farmhouse style wall decor! 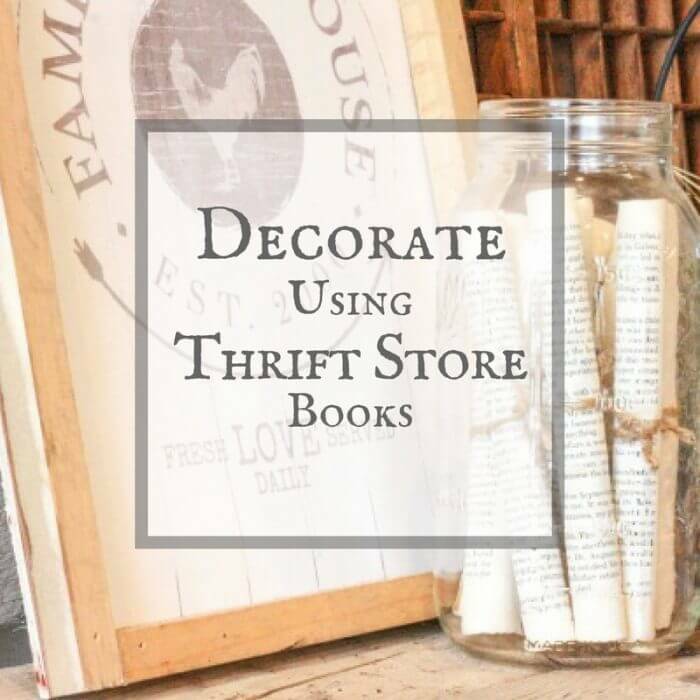 Are you a fan of thrift store shopping? 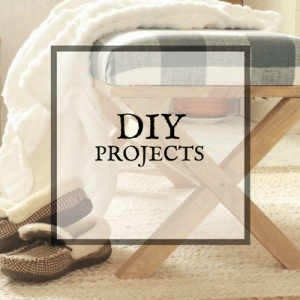 Check out all my other blogger friends and their thrift store projects below! Wait!!!! You may also like these! I am so in love with this!!!!! I love that finish, it looks perfect!! 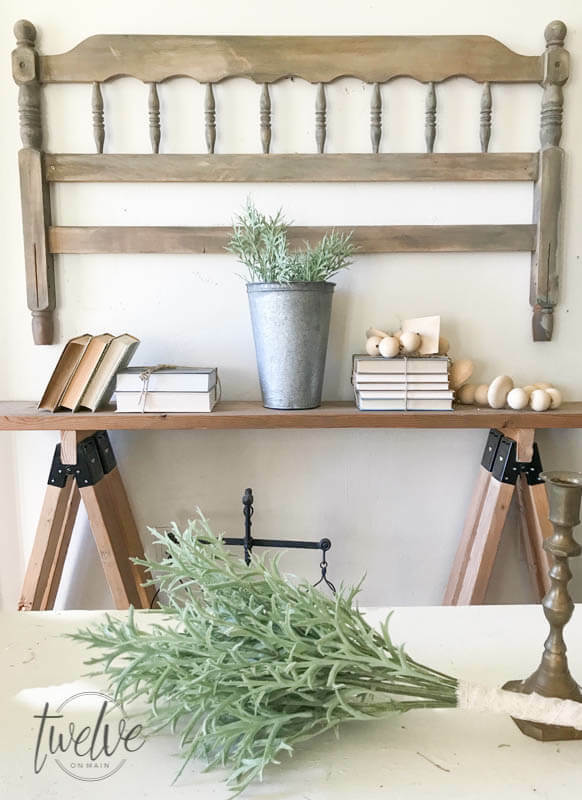 Great reuse, and it looks perfectly at home above the rustic console table. 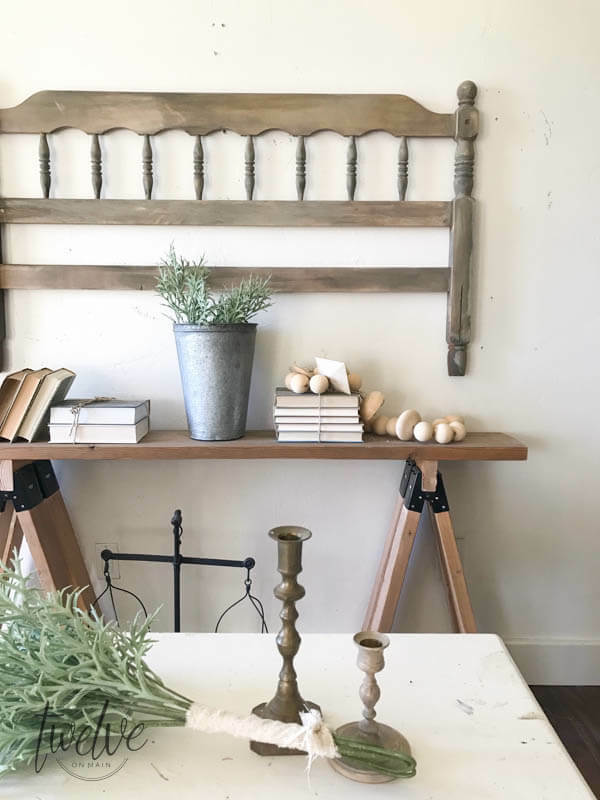 This will be a great place to hang decorations and homemade garlands for so many holidays. 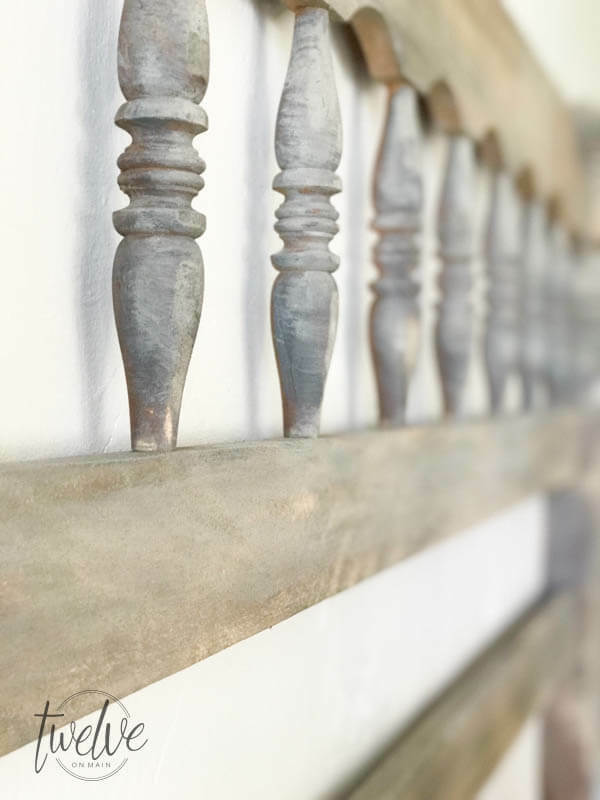 Great project, love that rustic weathered look. The spindles really give this piece it’s character. Love how you painted it. It looks really great on the wall. Visiting from Thrift Store Challenge. Sara I love this!! There is no way I would have been patient enough to sand down all those spindles either, so the finish you did was perfect!! Glad I am not the only one! Those spindles would have been a nightmare! Thanks so much! Love this. What a statement piece it became. I love this! 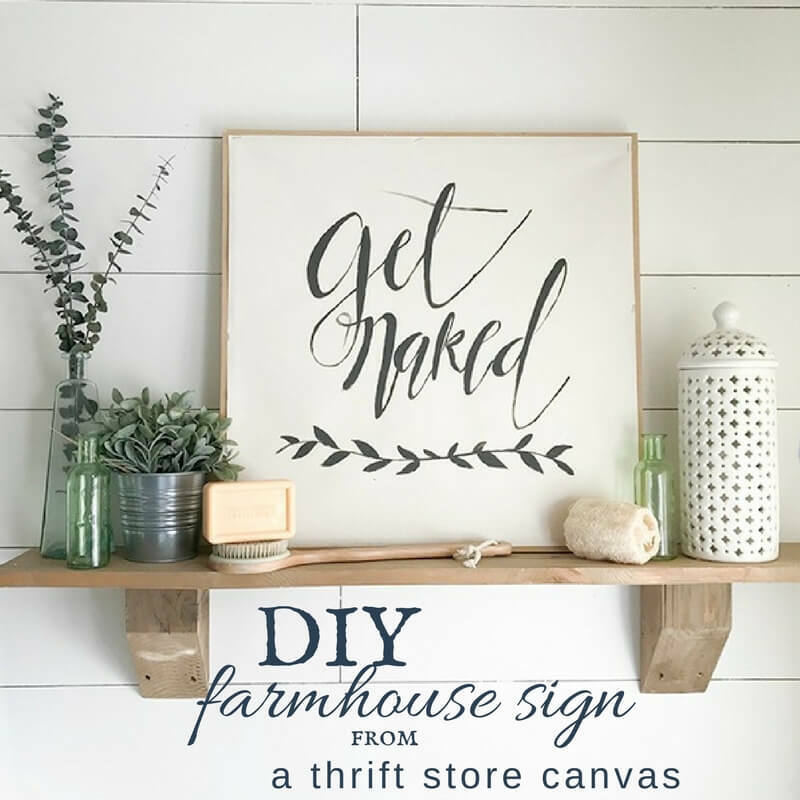 What a great idea to use it as wall art. The finish is beautiful! I love experimenting too. Sometimes, you get the best results when you do. What a gorgeous finish! 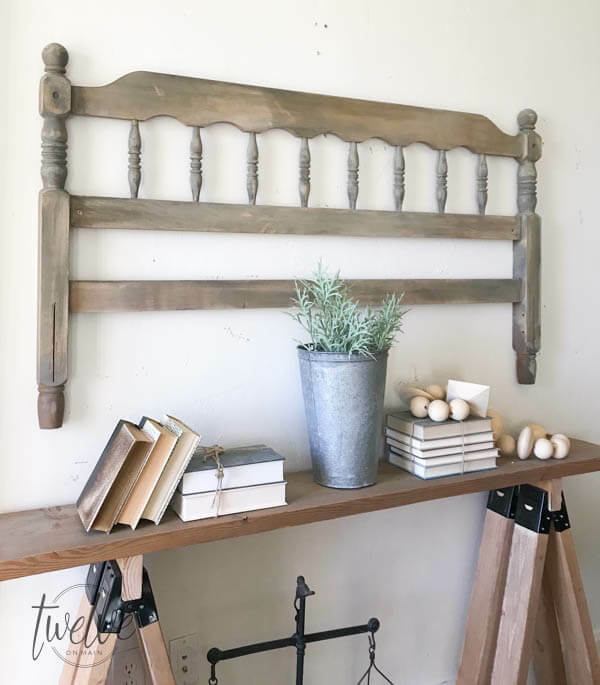 I have a very similar headboard in my garage right now, found at a neighbor’s garage sale, and now I’m inspired to make it over! Great job on the finish… Noway to sand by hand. Lovin that table underneath it too! Definitely a conversation piece! Love the finish you created! 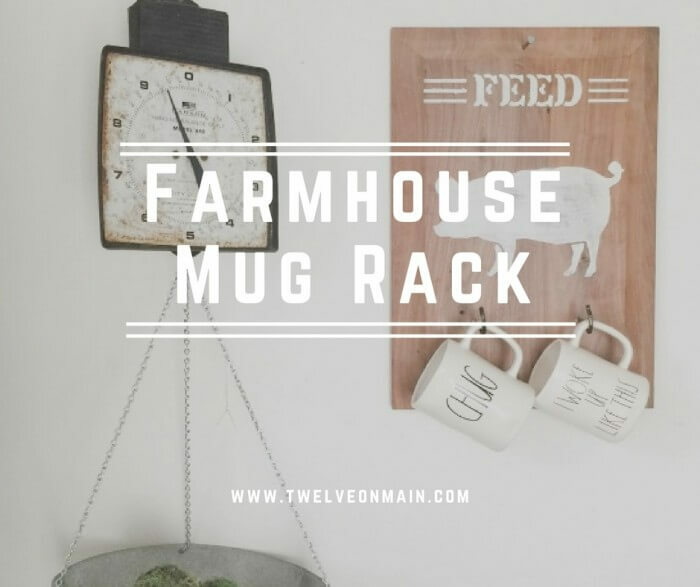 What a great farmhouse re-purpose project! Love how this turned out!!! Love the finish that you gave it!! This looks so nice and I would have never thought that a headboard could go on the wall. You did such a great job on the weathered finish. I tried it once and yours looks way better. Thanks for the tutorial! This turned out so pretty and looks perfect on the wall! 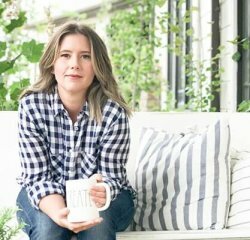 I never knew how to get that aged look before, but I really want to try it out now! I have not heard about that paint before, but love the finish!! 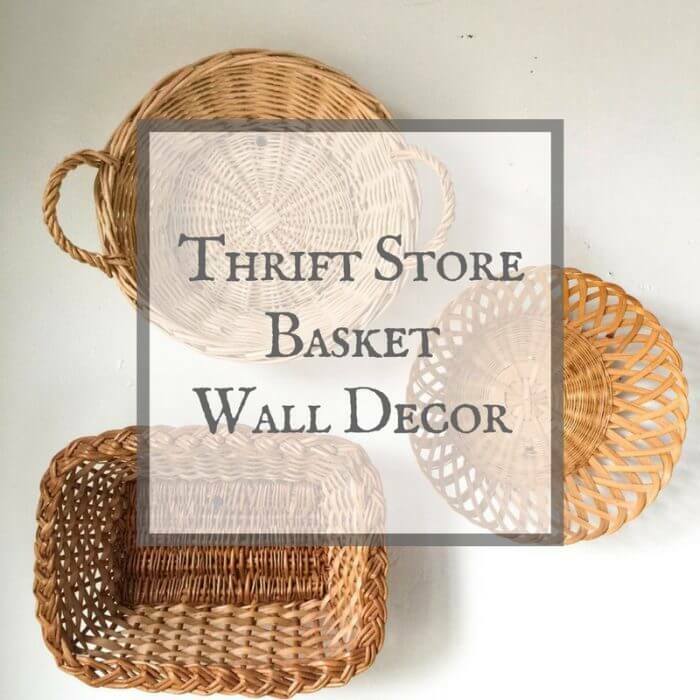 This and the other thrift store finds are simply terrific! You have done a great job. I love thrifting and do so most Tuesdays…. Thanks so much Nancy! Love thrifting!